Cobra sterndrive has a single oil cavity - all the oil in the upper and lower gearcase must be drained at the same time. Follow these easy steps for draining oil from your stern drive. Once you have completed the draining process, visit our Filling your OMC Cobra with oil help page for step by step instructions to fill your stern drive with oil. For technical breakdown drawings of upper and lower gearcases, see our I need help page. 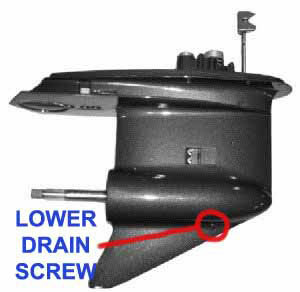 Begin by locating the lower drain screw/plug on the lower gearcase. (It is on the starboard side of the lower unit on the cone - shown in photo). Place your container which you will catch the drained oil into underneath this plug. Remove this screw/plug using the largest blade flathead screwdriver available. On the top side of the upper gearcase, you will see a cover, with four large bolts attached to it. 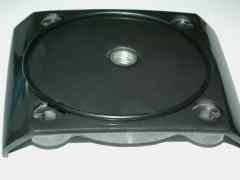 In the center of this cover or cap, you will see a 3/4" diameter flathead dipstick. Remove it using the flathead screwdriver. After the oil has finished draining, check the magnetic draining screw/plug you removed to drain the oil. If you find iron or metallic particles stuck to this screw/plug, this could indicate one of several problems - the most common being gears that are beginning to wear out. Be sure to check the color of the oil as well. Oil that is 'milky' in appearance means water is leaking into the housing, and mixing with the oil. The water could leak into the lower gearcase because of a bent prop shaft or worn out seals; or through the upper housing because of a bent water pump shaft or worn out seals. If you found iron/metal particles on your magnetic drain screw, you may want to inspect your gears in the upper housing and lower gearcase to assess the condition of your gears. Worn out gears could lead to more serious problems. 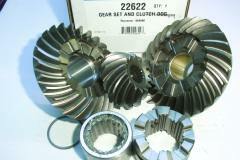 See our Cobra lower gears and upper gears pages for a variety of GLM aftermarket gears and gear sets.